Our Boston car accident lawyers know that many car accident injuries and deaths happen because drivers make bad choices when they are behind the wheel. In some cases, accidents cause harm to innocent victims because another driver has made the choice to drive drunk, speed or engage in other high risk behavior. In other instances, a motorist will increase the chances of becoming injured or killed in a crash by not wearing a seat belt. Public safety campaigns and laws aim to encourage good behaviors, like wearing a seat belt, and to discourage bad behaviors like driving drunk. Unfortunately, these laws and the efforts to educate the public only go so far. Now, the Huffington Post is reporting that the government is speeding up research on car safety systems that could address some of the most dangerous choices that people make behind the wheel. When the research is complete and reliable technologies developed, hopefully many lives could be saved by the new technological advances. Technology has already done a lot to reduce human error that leads to auto accidents. For example, many higher-end vehicles have rearview cameras; collision-avoidance systems; warning systems designed to alert the driver to oncoming dangers; and even crash detection systems that can result in the vehicle automatically slowing in order to reduce the severity of a crash. New advances could make technology even more effective at eliminating or reducing the risk of certain very serious types of crashes. For example, one of the proposed new technologies being worked on is a variation of an ignition interlock system (which are normally used by people who have been convicted of drunk driving). The new system would detect whether a driver has consumed alcohol before allowing the driver to start the car, but it would work in a way that is less of a hassle to the motorist than an ignition interlock device is. An ignition interlock device requires a driver to blow into a breathalyzer for his blood alcohol content (BAC) to be tested before he can drive and periodically on his journey. The new technology being worked on wouldn’t require any special action on the part of the driver. Instead, it would work either via touch or because of air samples taken when the driver is in the vehicle breathing. The goal would be to detect when someone’s BAC exceeds the .08 legal limit, but to do so in an unobtrusive way to avoid posing an inconvenience. 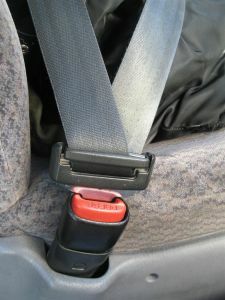 Another of the new technologies being considered is a seat belt interlock device that would prevent a car from being driven if either the driver or the passenger was not buckled into the vehicle properly. Such a system could save as many as 3,000 people from dying in a car accident each year. While the technology on the alcohol detection system is reportedly at least five years away, the seat belt ignition interlock system is closer to being developed, and the government is aiming to speed research on these and other car safety systems so that more lives can be saved sooner.